Why does it make me so happy? The marbling bug strikes again! These three lovely women made up the Beyond the Tank class I held mid-October. They all had taken an Experience the Tank class previously ~ and had to come back for more!! How awesome is that?! They trusted the process! They are pictured here with their overmarbles ~ a technique in marbling where you marble over a previously marbled piece. They were all hesitant to do the overmarble at first ~ not because it's a difficult technique (it's not!) but because they didn't want to marble over one of their creations. I convinced them that an overmarble would enhance their already beautiful work and take it to the next level. Look at the smiles on their faces...they were THRILLED with their results. They were great studio companions! This photo puts me back in the studio with them again. They were such a delight to marble with ~ creative, adventuresome, supportive of one another, receptive to learning. There was so much action in the studio ~ it was non-stop fun! Inspiration! When I look at this photo, I can't help but feel totally excited ~ and compelled ~ to hit the studio this weekend to work on a few personal projects. Thanks, ladies, for such a magnificent afternoon together! I'm teaching Experience the Tank classes this month on Sunday, November 11 and Saturday, November 17. 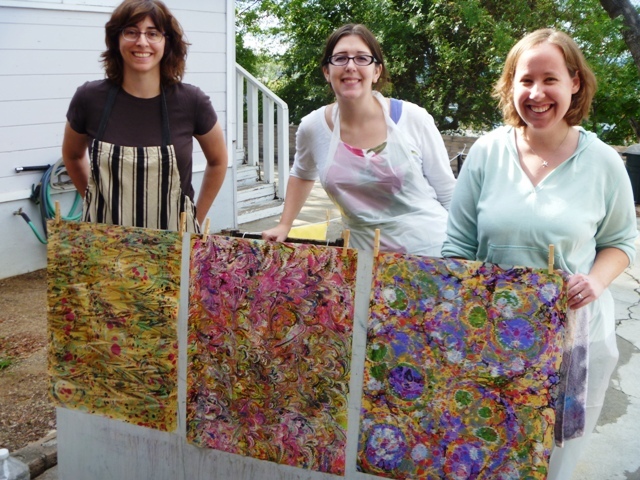 I'd love to have you join me in the studio for some marbling fun and creativity!